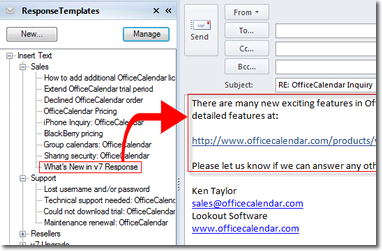 Response Templates for Microsoft Outlook (works with Microsoft Outlook 2003, 2007, 2010) is an intuitive addin that allows you to create and store email templates used for replying to frequently repeated email questions with a single click. Using an easy to retrieve folder storage system built into Microsoft Outlook, Response Templates enables you to easily find and insert the items you need (including text snippets, sentences, paragraphs, URLs, attachments, etc.) into your emails. Works directly inside Microsoft Outlook 2003, 2007 and/or 2010 (not an external application) so that you can Reply, Forward or Create a new email messages with the click of a button.